Hours: Mon., Tues., Thurs., 9:30a.m. – 3:30p.m. 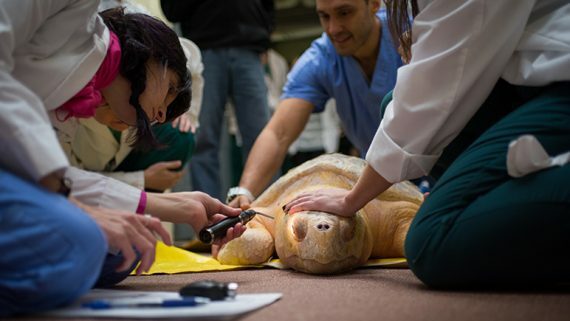 The Ophthalmology service at the NC State Veterinary Hospital provides specialty ophthalmic services for large and small animals referred by general veterinary practitioners. The entire staff helps provide a full range of diagnostic, therapeutic and surgical services. Our experienced, highly-trained, highly-skilled team includes four board-certified Ophthalmologists, two residents and one intern, three clinical technicians, and a client services representative. The service also pursues a busy schedule of cutting edge research and clinical studies, and as part of a teaching hospital, plays a key role in educating the next generation of veterinarians. WHAT MAKES NC STATE OPHTHALMOLOGY SPECIAL? 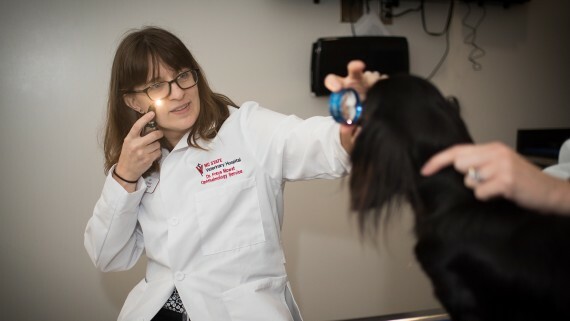 NC State is at the forefront of adapting advanced imaging technologies used by human ophthalmic specialists for veterinary use. NC has a state-of-the-art phacoemulsification machine for cataract surgery, which is also used in human cataract surgery. Ophthalmic ultrasound radiography specific to both Equine and Small Animal treatment is available. NC State developed the International Equine Ophthalmology Consortium, dedicated to the advancement of equine ophthalmology. Companion animals are seen at the Randall B. Terry, Jr., Companion Animal Veterinary Medical Center, and horses and other large animals are seen at the Equine and Farm Animal Veterinary Center. The Ophthalmology Service partners with various pharmaceutical, medical device, and other research organizations, such as Duke and the University of North Carolina, in the development of advanced treatment techniques. NC State operates two fully-equipped and staffed laboratories dedicated to ophthalmology research. NC provides care for non-domestic species in collaboration with such partners as the North Carolina Zoo, North Carolina Aquariums, the North Carolina Museum of Natural Science, the Environmental Medicine Consortium, the Alligator River National Wildlife Refuge and the Sea Turtle Hospital of Topsail Beach. The Cyclosporine Ocular Implant, one of the most effective long-term treatments for Equine Recurrent Uveitis, was developed at NC State. The Ophthalmology service provides a full range of diagnostic, therapeutic and surgical services to treat eye disorders, such as the ones below. Click on the name of the condition to learn more. Keratoconjunctivitis sicca (KCS) or “dry eye” is a very common ocular disorder affecting the cornea and conjunctiva. This condition is the result of inadequate tear production. Normal tear production is essential to good ocular “health” and a deficiency in tears can lead to serious and sometimes permanent eye problems. Although untreated KCS can potentially be a blinding disease, it is relatively easy to diagnose and usually responds favorably to long-term medical therapy. Below are some important facts about this disease. If untreated, a deficiency of tear film can lead to various ocular disorders. Once the tear film falls below a certain level of production (hence the term dry eye), the conjunctiva and cornea can rapidly become adversely affected. This can be a very painful process and lead to corneal ulceration and pigmentation. 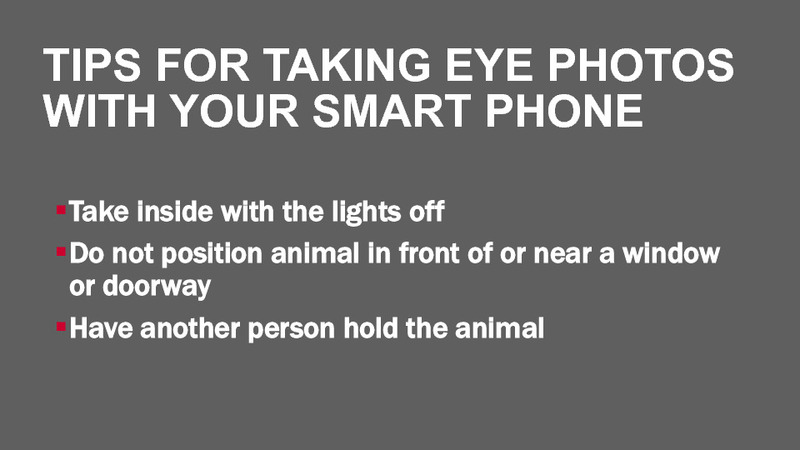 This can result in permanent visual impairment or even blindness. The diagnosis of KCS is based on clinical signs and is confirmed by the results of a quick and simple test to measure tear production. This test is painless, reliable and can be performed in the exam room. Your veterinarian plays a key role in the early recognition and management of this disorder before visual impairment occurs. There are many causes of inadequate tear production. Among the more common include: breed predisposition (inherited), immune mediated disorders (caused by the animal’s own immune system), use of certain drugs, and some systemic diseases. Breeds most often affected with KCS include West Highland White Terrier, Bulldog, Cocker Spaniel, Boston Terrier, Lhasa Apso, and Shih Tzu. There is a tendency to see KCS more often in females than males and it usually occurs in middle to older age dogs. We recommend that dogs affected with breed related KCS not be used in breeding programs. KCS is usually a treatable disease, however, it requires a long-term commitment from the owner. The exact frequency of medication may vary, but often includes the use of a high quality tear film replacement compound or “artificial tears” to mimic the natural tear film. It may be important to instill these drops as often as every two hours in the early course of therapy. These artificial tears are usually used in conjunction with drugs such as Cyclosporin or Tacrolimus. When Cyclosporin is administered topically onto the eye, tear production will significantly improve in about 80% of all cases depending on the cause of KCS. The exact mechanism by which Cyclosporin or Tacrolimus increases tear production is not fully understood. The increase in tear production usually occurs within the first couple of weeks of twice a day therapy. An occasional “late responder” will start to increase tear production within an additional few weeks. Even when tear production returns to normal or near normal limits, therapy must continue for the life of the animal. In certain cases the frequency of artificial tear therapy can be reduced or even discontinued once the full effects of Cyclosporin have been realized. This emphasizes the importance of early recognition of KCS and initiation of proper medical therapy. In many cases, the damage to the cornea and conjunctiva will significantly improve once the tear production is returned to normal. Cataracts are a leading cause of visual impairment in dogs and frequently progress to cause total blindness. Fortunately, the vision of affected dogs can often be restored to a normal state by surgically removing the abnormal lens and substituting an artificial lens in its place. The majority of cataracts in dogs are the result of a genetic, or inherited, defect involving the lens. Many types of purebred dogs are predisposed to inherited cataracts, which may be present at birth or develop later in young to middle-aged animals. Dogs affected with inherited cataracts should not be used for breeding purposes. Cataracts are also associated with diabetes, advanced age, trauma, and retinal disorders. Depending on the cause, cataracts may or may not progress to total blindness. The rate of progression is often predictable and can be determined by a thorough examination by a veterinary ophthalmologist. Currently, the only effective treatment for cataracts is through surgical removal of the defective lens. Lens removal is done under general anesthesia by making an incision in the eye and using special equipment to ultrasonically fragment and remove the diseased lens material. In most cases, an artificial intraocular lens is implanted to replace the diseased lens. Due to the optical properties of the artificial lens, light can once again be focused on the retina. Lasers are not used to remove cataracts but are occasionally used several months after standard cataract removal to cut away debris that can develop around the intraocular lens. Surgery is generally recommended when the cataracts cause diminished vision, or for progressive cataracts where vision loss is anticipated. The surgical success rates for cataracts in the early stage are higher than for advanced cataracts that have been present for months to years. 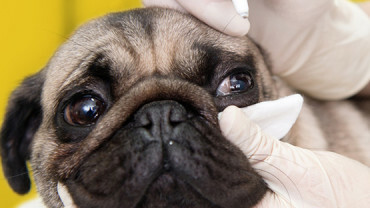 The preoperative evaluation by a veterinary ophthalmologist will include an ocular examination to screen for other eye disorders, and a laboratory analysis of blood and urine samples to help determine the general state of the dog’s health. An ultrasound evaluation of the eye and a special diagnostic test called an electroretinogram will also be performed to screen for any retinal disorders that could interfere with a successful outcome. The success rate of uncomplicated cataract surgery with intraocular lens implantation in dogs is approximately 95% or, in other words, 95 out of 100 eyes will have functional vision after surgery. The outcome may vary, depending on the overall “health” of the eye. 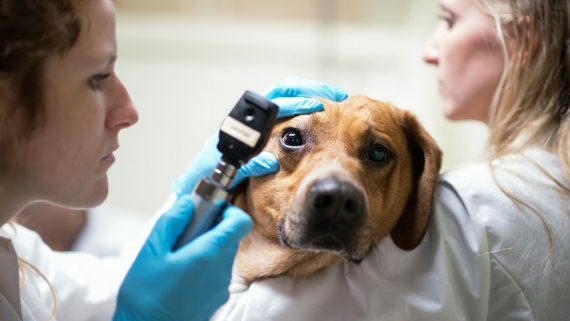 After examination and testing, the ophthalmologist will assess the risks and benefits of surgery with the owner to help determine the best decision for the dog. Retinal Detachment is a condition where the retina separates from the underlying tissue. Total retinal detachment causes vision loss, but sometimes it is possible to correct this complication with surgery. Excessive Inflammation, or uveitis, is a potentially serious problem. Patients with eye inflammation prior to surgery are more likely to develop this problem. Increasing the frequency of medical therapy can sometimes correct this complication. Glaucoma refers to higher than normal intraocular pressure. Some dog breeds are predisposed to glaucoma and may be more likely to develop it after surgery. Medical and surgical therapy can often control this complication. Capsular Opacification, or “secondary cataract,” refers to the cloudiness of a membrane in the eye that surrounds the prosthetic lens (once a cataract is removed, it cannot truly return or recur). This opacity rarely occurs to such an extent that it causes visual problems. A laser procedure may sometimes be used to correct this complication. The patient is discharged the day after surgery wearing a special collar to protect the eyes from irritation for 2 – 4 weeks. The dog’s exercise and activity need to be restricted to prevent injury to the eye. Topical medication will need to be instilled into the eye 4-5 times daily for several weeks. Reevaluation by the ophthalmology service at NC State is required at 1-week, 3-week, 6-week, 3-month, and 6-month intervals after surgery to observe the eye and attempt to correct or prevent any complications. With a successful surgery, vision is often restored immediately although this is sometimes difficult to appreciate in dogs for the first 1-2 weeks after surgery. The dog’s regular veterinarian plays a key role in the proper maintenance of overall ocular health, and their role in the successful management of cataracts is no exception. Early detection of cataracts by the primary veterinarian, with subsequent referral to a veterinary ophthalmologist, can have a positive influence on the eventual outcome. Owners should also actively seek the advice of their veterinarian when considering cataract surgery for their pet. Surgery is not indicated in every case; however, it often restores useful vision to dogs whose sight is lost or impaired due to cataracts. The cornea is the clear outer layer of the eye. A corneal ulcer refers to disruption of the epithelium (surface layer) of the cornea. Corneal ulcers may be caused by: exposure due to a large eyelid opening, irritation from eyelashes or an eyelid tumor, trauma to the eye, inadequate tear production, or other ocular diseases. Once the cornea is ulcerated, bacteria can multiply in the affected area and cause the ulcer to become much worse. If treated properly, minor ulcers often heal without complication. More serious ulcers may cause permanent scarring of the cornea or even progress until the eye perforates (ruptures). This is extremely painful and if left untreated, causes loss of vision and requires removal of the eye. Some signs of a corneal ulcer include: pain and squinting, redness of the sclera (white part of the eye), tearing and discharge from the eye, and an abnormal appearance to the cornea. This abnormal appearance may include a bluish or white discoloration, blood vessels growing into the cornea, or a dark brown discoloration from pigment on the cornea. A veterinarian can detect a corneal ulcer by applying a fluorescent-green, non-toxic dye to the surface of the cornea. A careful examination of the eye is necessary to identify the underlying cause of the ulcer. Corneal ulcers are treated differently depending on their cause, severity, and whether or not infection is present. Minor or superficial ulcers generally heal with topical antibiotics and a medication to dilate the pupil and relieve pain. Treatment may also include debridement of the ulcer. This means removal of the outermost layer of the cornea that is unable to attach to the deeper layers. This is a minor procedure and is done in the exam room with topical anesthetics and a cotton swab. More severe ulcers that are in danger of causing perforation of the eye are generally treated surgically by placing a graft over the corneal ulcer. These grafts are generally taken either from the conjunctiva (conjunctival graft or flap) or cornea from a donor animal. If these more serious ulcers heal successfully, they generally leave a whitish scar on the cornea, which may interfere with vision in that eye. It is critical to identify and treat any underlying cause for the corneal ulcer, or it may worsen or recur. Distichia are abnormal cilia or eyelashes emerging from the eyelid margins where the meibomian gland openings are located. Distichia occur most commonly in the following breeds: Cocker Spaniel, English Bulldog, Toy and Miniature Poodles, St. Bernard, Golden Retriever, Boxer, Longhaired Miniature Dachshund, Yorkshire Terrier, and Pekinese. Distichia may be fine, soft, pliable and may be directed away from the eye. Therefore, animals with this type of distichia may have no problems and require no treatment. In other instances, distichia are coarse and rub the cornea, causing considerable irritation, and possibly corneal ulceration. When mild irritation is associated with distichia, topical lubricant ointments or removal of the cilia may afford temporary relief. In cases where distichia are causing persistent irritation, the cilia should be removed by cryosurgery. This involves freezing the affected portion of the lid margin with a special probe to destroy the hair follicle. Cryosurgery is a very effective form of therapy for distichia. However, it does not always prevent growth of new distichia, which may occur in some patients. After surgery, moderate discomfort and swelling is expected. Generally, this is present over the first two to three days and then slowly resolves. Temporary depigmentation (whitening) of the eyelids is common, however, the pigment usually returns within 4 to 6 months after surgery. 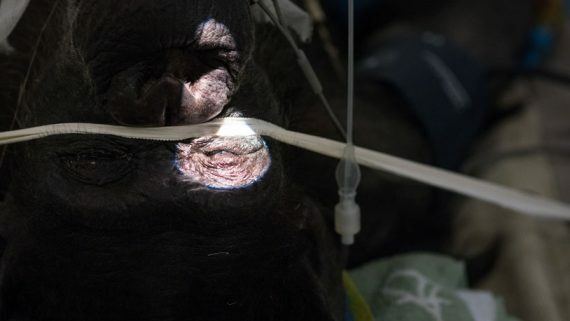 Cryosurgery is generally very effective for treatment of distichia, however it is not uncommon for new distichia to develop in affected animals. The procedure can be repeated if this occurs. Entropion is a conformational defect resulting in “in-rolling” of one or more of the eyelids, which causes ocular irritation. Developmental or conformational entropion is a rolling in of the eyelid margin of one or more lids. Other forms of entropion are spastic entropion, which occurs secondary to ocular pain, and cicatricial entropion, a result of eyelid scarring. All of these conditions result in contact of the eyelashes with the corneal surface. The irritation is very painful and may lead to a corneal ulcer. Diagnosis is made upon clinical examination. Clinical signs may include tearing, conjunctivitis, and keratitis with or without corneal ulceration. Decreased vision may result from constant eyelid closure or associated corneal opacities. Entropion is commonly seen in Shar-Peis, Chow-Chows, Rottweilers, Great Danes, Labrador Retrievers, and English Bulldogs. When entropion occurs in young animals, eyelid tacking is used to temporarily evert (turn out) the eyelids. Eyelid tacking is used extensively in puppies with conformational entropion. If necessary, eyelid-tacking procedures may be repeated in young dogs until they reach their full size. Many puppies simply need to “grow into” their eyelids. Tacking may also be used in adult animals for relief of pain associated with spastic entropion. Following eyelid tacking, standard care includes an Elizabethan collar. Sutures are generally left in place for 2-3 weeks. Chronic or recurring entropion requires surgical correction. The most common surgical procedure is called the Hotz-Celsus procedure which involves removal of a crescent of skin from the affected eyelid. This area is then sutured closed, causing the eyelid to revert to a normal position. Some dogs require multiple surgical corrections. Following entropion surgery, eyelid swelling should be minimal and usually resolves within 48 hrs. Postoperative care includes an Elizabethan collar and daily topical antibiotics. Sutures are generally left in place for 10 days. Glaucoma is a common eye disease in dogs, cats, and horses in which the intraocular pressure (IOP) is abnormally high. It often results in irreversible blindness and is usually painful for the animal. Glaucoma can occur spontaneously in certain breeds of dogs (primary glaucoma) or may be caused by cataracts, lens displacement, inflammation, trauma or certain forms of cancer of the eye (secondary glaucoma). Canine glaucoma is divided into 2 major groups: primary and secondary. With primary glaucoma, the drainage angle in the eye is too small, causing fluid to “back up” in the eye and raise the IOP. This occurs primarily in purebred dogs. Primary glaucoma most commonly afflicts dogs at 3-7 years of age but can occur at any age. The disease is most frequently seen in Cocker Spaniels, many of the terrier breeds, Poodles, Beagles, Chow-Chows, Bassett Hounds and Dalmatians. However, primary glaucoma has been identified in almost every breed of dog. The effects of elevated IOP in the dog vary with the age of the animal, duration and levels of IOP. Primary glaucoma often occurs in one eye initially, but develops in the other eye within weeks to months. Dogs with early glaucoma may only have a mild redness to the eye. Moderate forms of glaucoma cause a bluish-white discoloration of the cornea, and may cause blindness in the effected eye. It is important to understand that high elevation in the IOP causes irreversible damage to the retina and optic nerve in a very short period of time (24-48 hours). As a result, glaucoma is considered an emergency, and requires immediate treatment if vision is to be maintained. Glaucoma that is severe and lasts more than 10-14 days often causes an enlargement of the eye. There are 3 methods that are particularly useful in the diagnosis of glaucoma: (1) tonometry, (2) gonioscopy, and (3) ophthalmoscopy. Tonometry involves measuring the IOP with an instrument, most commonly a Schiotz Tonometer or a TonoPen. Normal IOP in dogs can range between 12 and 25 mm Hg and the two eyes should be similar in pressure. Gonioscopy is a diagnostic procedure to examine the angle of the anterior chamber. This is done by placing a gonioscopic lens on the cornea and using a hand-held slit lamp to permit magnification of the angle. Dogs who are predisposed to glaucoma will have an abnormally small or narrowed angle in both eyes. Direct and indirect ophthalmoscopy is necessary to evaluate the retina and particularly the optic nerve. The goal of treating early forms of glaucoma is to maintain a normal IOP and to preserve vision. Medical treatment often involves long-term administration of topical medications to decrease IOP. A laser surgery is often also necessary to control the IOP. If the vision has been lost due to chronic glaucoma, the goals of therapy are generally to make the patient comfortable. Chronic glaucoma is treated with surgery to relieve the pain associated with high IOP. Unfortunately, many forms of canine glaucoma are difficult to treat and have a somewhat guarded long-term prognosis for vision and comfort. Diagnosis of feline herpes virus is made based on clinical signs and a complete history. Treatment of feline herpes virus is difficult. The virus lives within a host cell and replicates by altering the cell’s normal DNA. Antiviral medications must kill the virus without harming the host cells. Recovery is dependent on the animal’s own immune system to eliminate the virus, although complete recovery may not be possible. For this reason, the treatment regimen must be strictly followed. Also, periodic recheck visits are required to follow progress of treatment and any complications that may occur. However, many treatment options exist, and may vary depending on the severity of the disease. If a corneal ulcer is present, debridement (removal of diseased tissue) may be necessary to promote healing of the cornea. Bacteria often invade diseased tissues and worsen the effect of a viral condition, therefore, topical antibiotics are prescribed to treat/prevent secondary bacterial infections. The conjunctiva becomes very swollen and inflamed. Topical anti-inflammatories may be used to decrease inflammation of the conjunctiva and reduce discomfort. Several oral medications are available. Oral L-lysine is an amino acid used to decrease viral replication. Oral or topical antivirals may also be used to decrease viral replication. Oral or topical interferon is sometimes also used as an antiviral medication. Scarring ,which may affect the cornea, causing cloudiness or occlusion of the tear outflow duct, resulting in tearing. Decreased in tear production called “dry eye”. This may be treated with topical medications. The service also performs breed certification eye examinations of purebred dogs. This annual diagnostic examination screens for inherited or congenital eye disorders so that breeding recommendations can be made. Go to the Ophthalmology Clinical Studies page for information on current clinical studies. Details include the study’s purpose, benefits for participating, and financial incentive information. The Small Animal and Equine Ophthalmology services are available 24 hours a day, 365 days a year for treatment of emergency problems. To make a referral on an emergency basis, call 919.513.6659 or 919.513.6911. In non emergency cases, the patient’s primary veterinarian will call the Ophthalmology service and provide us with previous medical history and referral information. Hours: The Ophthalmology service receives elective cases 9:30AM-3:30PM Monday, Tuesday and Thursday by appointment. We perform elective surgery on Wednesday and Friday. After the referral has been made, owners may call us to make the appointment. Referring Veterinarians can also call for consults at anytime. It is not possible for us to provide advice about patient treatment over the phone or by email; however we will gladly schedule appointments and provide the owner with some general information about the problem. The patient is discharged the day after surgery wearing a special collar to protect the eyes from irritation for 2 weeks. The dog’s exercise and activity need to be restricted to prevent injury to the eye. Topical medication will need to be instilled into the eye 4-5 times daily for several weeks. Reevaluation by the ophthalmology service at NC State is required at 2-week, 6-week, 3-month, and 6-month intervals after surgery to observe the eye and attempt to correct or prevent any complications. With a successful surgery, vision is often restored immediately although this is sometimes difficult to appreciate in dogs for the first 1-2 weeks after surgery. The VH is a not-for-profit health care center and receives less than 2% of operating costs from the the State of North Carolina. The majority of our operating costs are paid by client fees and donations. In fact, many of the state-of-the-art diagnostic and treatment options we offer are only possible because of generous gifts from our clients. Our fees are set to cover the balance of our operating costs, and we are always looking for ways to provide better service at lower cost. Total costs are comparable to those of veterinarian specialists in private practice.